By the time I debarked from my two-month tall ship journey, not only did I know how to belay, sew sails, and polish brass, I had a healthy curiosity about the Dutch–this strange, tall seafaring race that taught me how to do all of that stuff. It was weird that I’d spent two months learning about this culture, but had never actually visited the country. Last month, I remedied that. Word somehow got around that I was in the country, and my trip was soon full with reunions with shipmates-turned-friends-for-life, beer and gossip flowing, and (just like on the ship) plenty of tears (long story, but what can I say? The sea, even the memory of the sea, makes me emotional). Oh Captain, My Captain was on hand to squire me around, introduce me to virtually everyone in the country ever associated with ships, and show me a few spots I never would have found on my own. That aside, if you’re just there to take in the sights (probably a safer option), you don’t have to go far–from the canals to the museum art, the sea is never far. Exterior of the National Maritime Museum (Het Scheepvartmuseum), with the ship Amsterdam visible. Of the two maritime museums I visited in the Netherlands, this was my favorite. 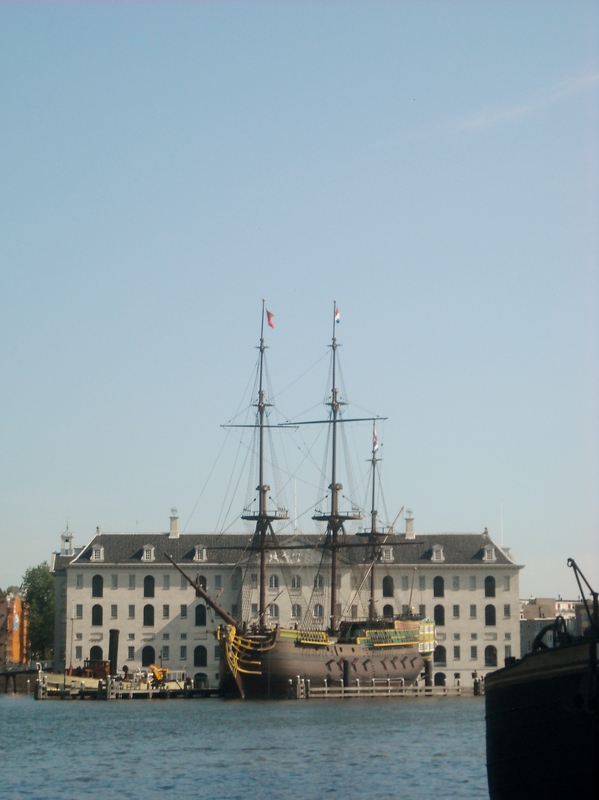 Het Scheepvartmuseum, as it’s known, is located in a formal naval storehouse constructed in 1636, and you can tour the replica of the 18th-century East Indiaman Amsterdam. The audio tours are free! It also has a first edition of Maximilian Transylvanus’ work, De Moluccis Insulis, which described Ferdinand Magellan’s voyage around the world. My favorite was the starlit navigation room, which had old-fashioned astrolabes and compasses, and reminded me of long, cloudless nights at sea, searching for constellations like Scorpio and the Southern Cross. One of the Museumhaven’s grand dames. If you’re traveling with a kid, you might be on your way to the science museum Nemo, a truly astonishing feat of engineering sticking out from the Oosterdok area. 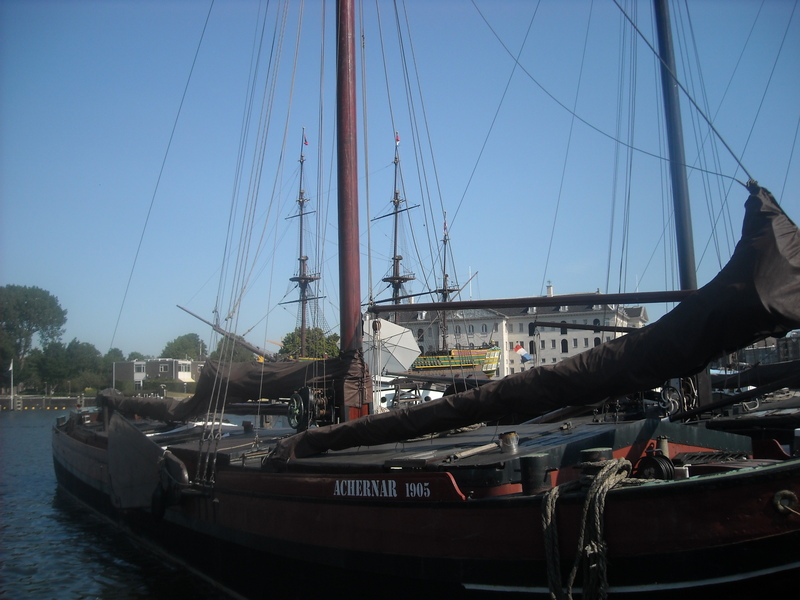 But on the way, you can check out the Museumhaven, a little piece of (free!) ship geek heaven. 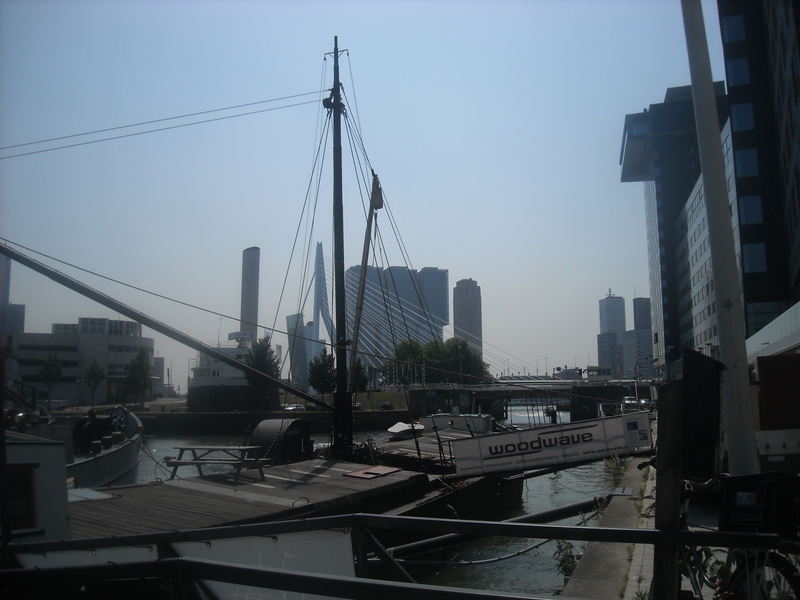 Long gone are the days when sailing ships transported freight along the inland waterways, and if you travel the canals, you can see what happened to a lot of them. But the ships here still have their masts attached and give you a glimpse of the way things used to be, as they wait to be restored to their former glory. You can stop and read the placards about all of them. 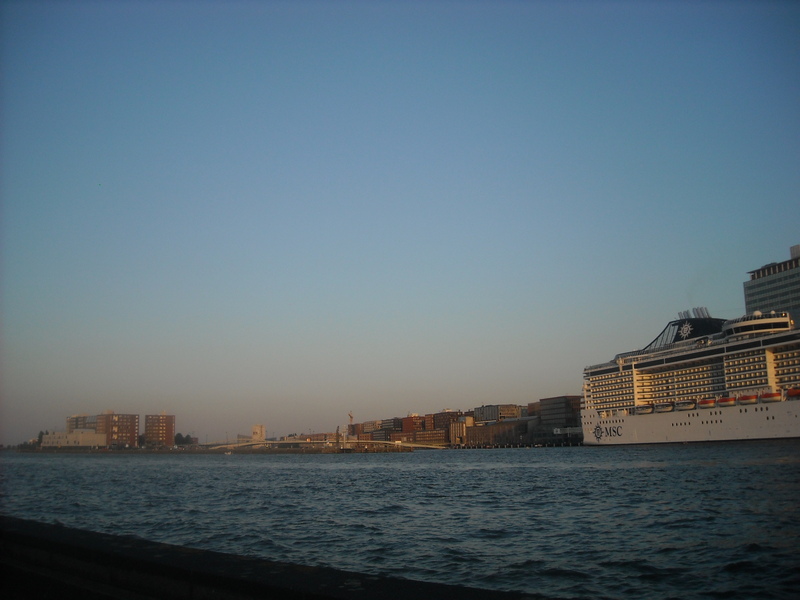 The view of Amsterdam across the river IJ, with cruise ship. Another awesome free way to get a sailor’s-eye view of Amsterdam. The ferries are free and leave frequently just north of Central Station, are often packed with pedestrians, cyclists and motorbikes. 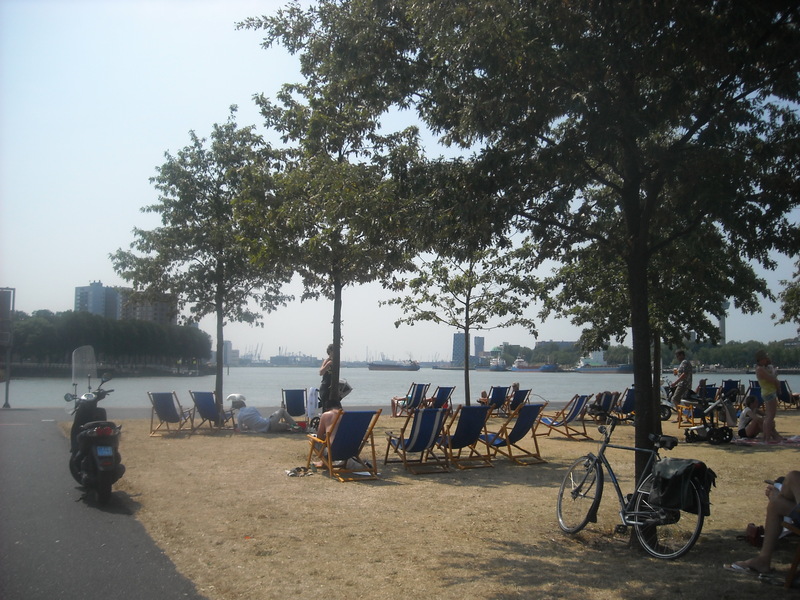 There’s not a whole lot to see in Noord, separated as it is from the rest of Amsterdam by the river IJ. 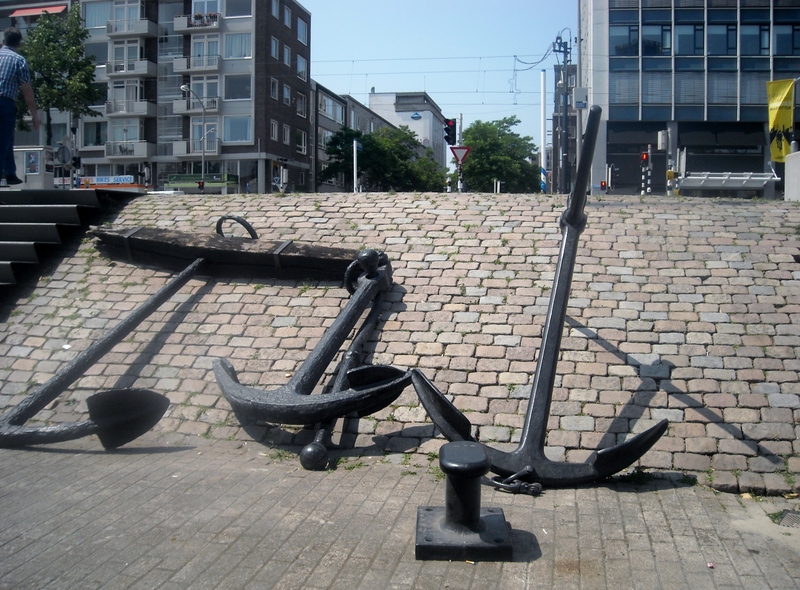 But what more do you need than to sit on the bench, admire the Amsterdam skyline, and watch the ships go by? When I was there, a gigantic passenger ship was blocking part of the view–just a sign that Amsterdam is regaining its place as a cruise destination. There’s a conveniently placed bar there, too–you’re never too far from a place to drink a beer in Amsterdam. The view from the museum harbor. The whole city is like a living maritime museum exhibit, given that it was the world’s largest port for hundreds of years. 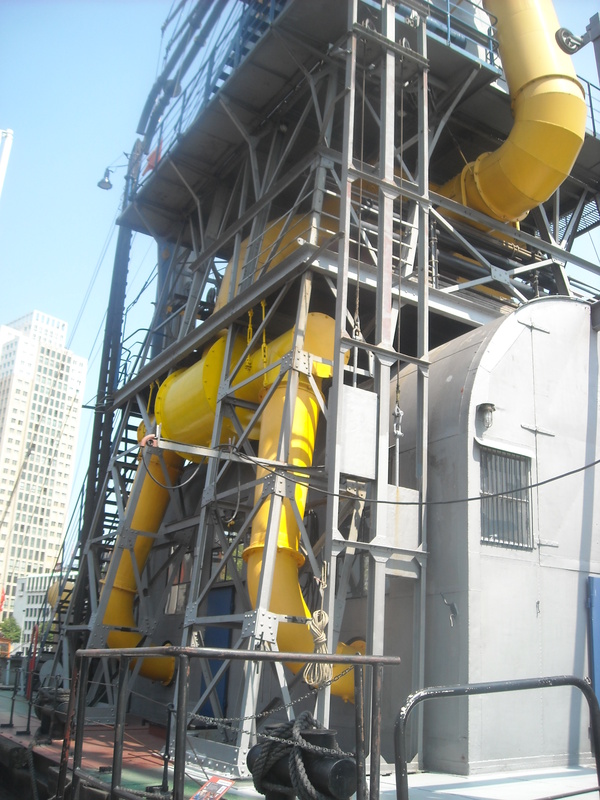 Unfortunately, you won’t see the working port if you stay within the city center. However, you can experience the historical part of it by visiting the Maritime Museum (just don’t go when there’s a birthday party going on, yikes! ), which is located just a few blocks from Central Station. The focal point is the museum harbor outside, where you can tour a grain elevator and any other ship that happens to be open at the time–which isn’t always easy to tell. Grain elevator you can go onboard and tour. Of course, this won’t mean as much to someone who, like me, didn’t spend two months on one of these ships, but since I did, it was like visiting an old friend. The ships themselves weren’t there–the Oosterschelde was spending the summer cruising in Norway. 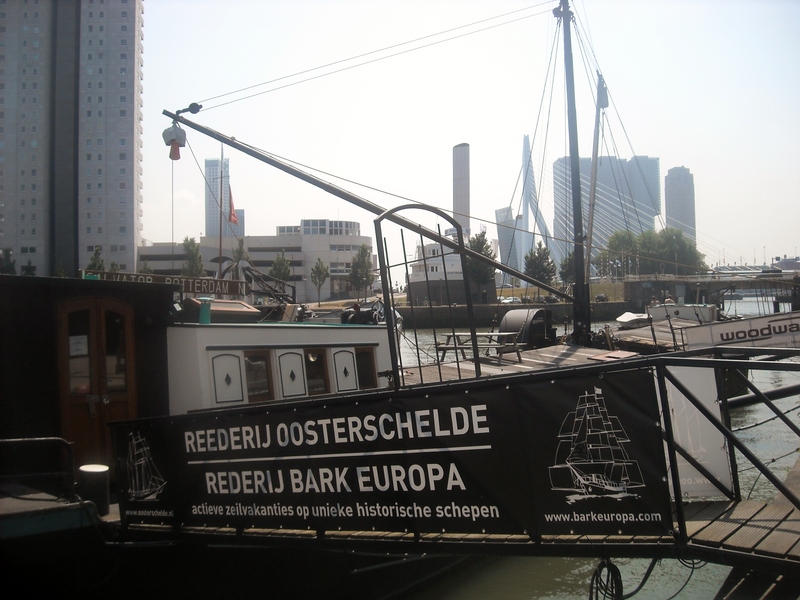 But I did get to see sister ship the Helena–which met the Oosterschelde when it returned to Rotterdam from its circumnavigation. Plus, their office is on a boat, and it’s right in the museum harbor, so you don’t have to make another trip. Warning: Don’t bother with buying a water taxi ticket in the museum. I waited in line for 30 minutes only to have my spot taken by a bunch of rowdy schoolkids and their teacher (getting on the boat with hem would have been fairly close to my personal definition of hell, so I didn’t even try). Instead, wait for the other water taxi (below). It won’t take long, promise! 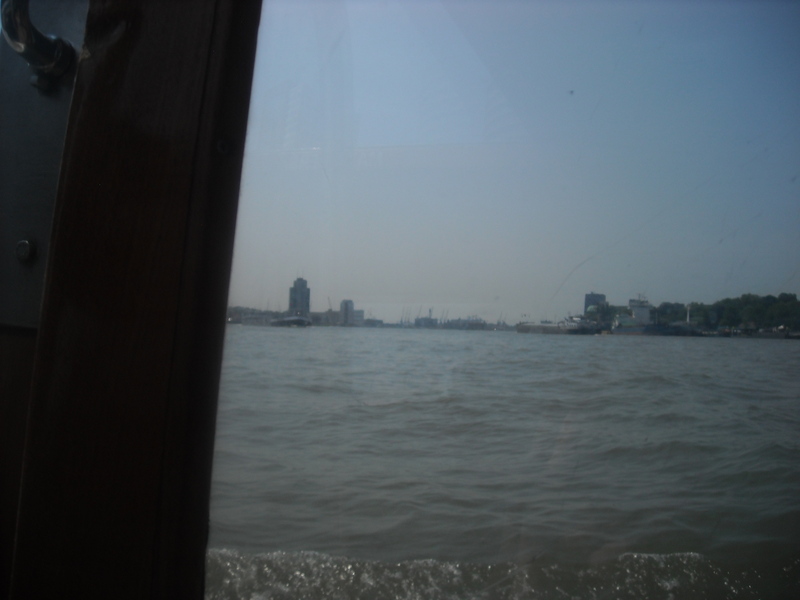 The view from the Rotterdam water taxi. The water taxi delivers you to the very Art Deco Hotel New York. It’s a short ride and the cool breeze of the harbor feels incredible, especially if you happen to be there, like I was, during the biggest heat wave to hit Europe in a long time. No ticket required–you can pay cash to the taxi “driver,” and one leaves just about every few minutes. “You come back, there’s a boat,” as the guy put it . Enjoying the summer heat wave in front of the hotel. 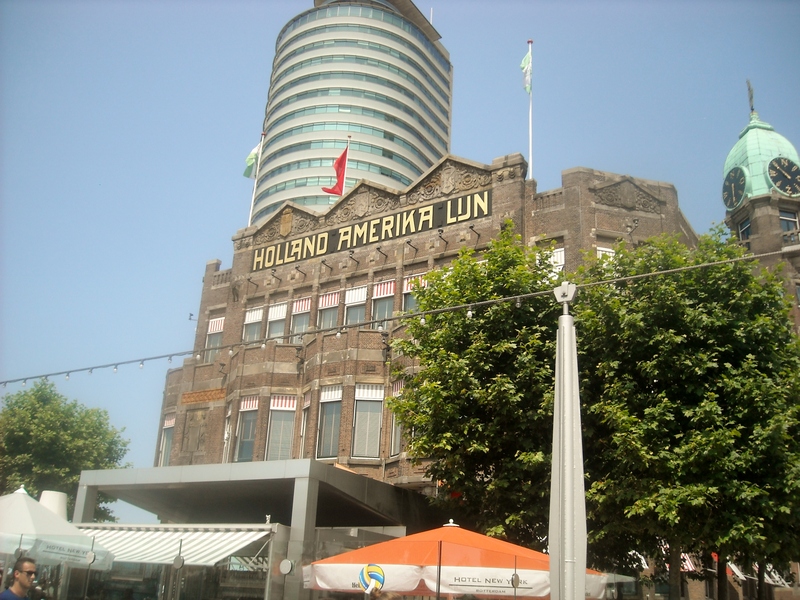 Plus you get to see the Hotel New York, former HQ of the Holland America Line, which is only accessible this way. Supposedly there’s a great view from the top, but I couldn’t find the way up. I was on my way to Brussels so I had to keep to my schedule, but I would have loved to linger here longer and have a drink. Plenty of others were!